OK. First, the dragon on the front page is not the BIG, BLACK Shruikan (ie Galbatorix's dragon). It is Firnen and its green. And its Arya's. And it shows up at the very end of the book. Thus Arya becomes a dragon rider. What a surprise. 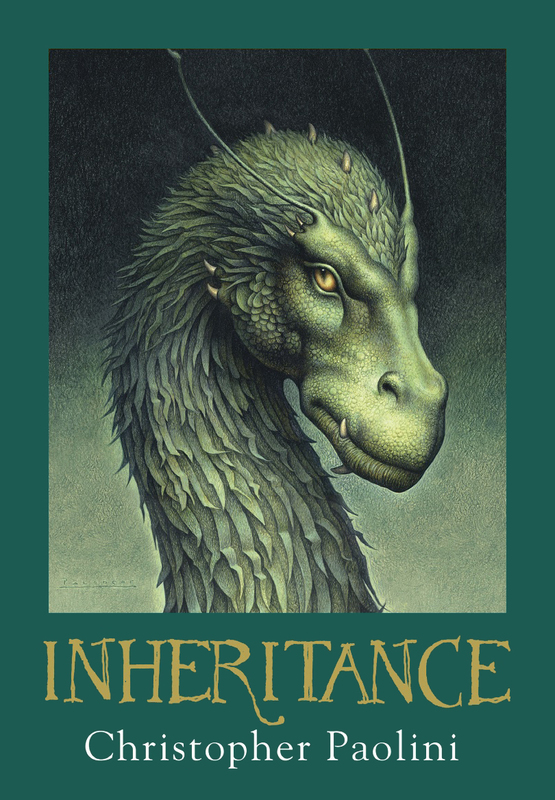 So now that thats out of the way lets get into the Galbatorix killing business which is what the Inheritance cycle is about. Paolini sets up his characters beautifully. Eragon ofcourse the Luke Skywalker like protagonist. Galbatorix is the Darth Vader like villain. Arya is the gorgeous elf who Eragon has a giant crush on. Glaedr like Obi-wan Kenobi is the all-knowing, experienced dragon; teacher and ever-present advisor to Eragon and Saphira. Nasauda, the leader of the Varden, the strong figure who makes important and right decisions and is a sharp politician. King Orrin from the begining is the annoying character, an alcoholic who is constantly complaining. The dwarf king Orik is the cheerful supporter of both Nasauda and Eragon. Garzhvog, the Urgal leader is another interesting one. Roran, Eragon's brother (not by blood) is the one human warrior leader that sigle-handedly wins battles without magic. Murtagh, Eragon's foster brother, part friend, part villain, sworn to Galbatorix is an enigmatic character. Elva, the witch girl who senses peoples pain, can make people do her bidding, one who even Galbatorix is afraid of. Lastly, Angela, is the mysterious one whos adventures might form a future book from Paolini. He takes his own sweet time put together this story, as he should. It is a really impressive story make no mistake. Basically he gets the Varden to take over Belatona. Then Dras Leona. Then Uru'baen. The book starts with the seige of Belatona. There a giant wall crashes over Roran but he lives. Also the Varden find a Dauthdaert - a rare sword that could kill dragons - named Niernen. The werecats join the Varden after the battle. Roran Stronghammer is then sent to Aroughs to clean the mess and take over the place for the Varden. Once he reaches the place, despite his condition, he takes hardly a week to resort the situation. Some outrageous, brave and out-of-the-box thinking gets his troops into the city. A fierce battle follows. There follows a crazy mind-fight between the opposing magicians when the enemy magician loses control and explodes everything around him. Carn, magician of the Varden, dies but his spell drains the enemy magician off all moisture from his body. Thus Roran takes over the Aroughs. Meanwhile Eragon continues his training with the elves and Glaedr and the Varden reach Dras Leona. Murtagh and his dragon Thorn, awaits them in Dras Leona. Eragon, Arya, two more elves, Angela and a werecat decide to sneak into the city through a forgotten tunnel. Saphira is to distract Thorn and Murtagh from the outside while Eragon is to open the gates from the inside. Thats the plan. Unfortunately on their way Eragon and the others are trapped by Razac worshipers. One of the elf is killed. Eragon and Arya are nearly fed to a Razac but Angela comes to their rescue. Angela then also kills the 'High Priest' who matched the combined minds of Eragon and Arya. Saphira injures Thorn and the Varden take Dras Leona. However manages to escape with Nasauda who he takes to Galbatorix. Eragon then takes over the Varden's lead. He is faced with the question how is he to defeat Galbatorix. He decides to heed a previous prophecy and heads to Vroengard, to the home of the old dragons and riders - Doru Araeba. Saphira goes through an uncompromising storm through the sea to get them there. Once there they notice the ruins, the destruction and how the place has been corrupted by misplaced magic. He and Saphira discover there true names and enter the vault of souls. There they find protected Edunari of the old dragons believed dead and dragon eggs. The old dragons accompany Eragon to the Uru'baen. The Varden meanwhile heads to Uru'baen. Nasuada on the other hand is resisting tortures by Galbatorix who wants her to swear fealty to him. The battle at Uru'baen is again into two parallels. Eragon, Saphira, Elva, Arya, the old dragons and the elves go in chase of Galbatorix. The rest which now includes the elf army under elf queen Islanzadi meet Lord Barst and his army in the city. This is the greatest climactic battle of the series. Barst nearly destroys the Varden single-handedly. He kills the elf-queen. It takes the whole group of huge stones, Urgals and werecats to weaken him. Roran eventually breaks the Edunari he carries defeating him nearly killing himself in the process. Galbatorix hosts the rest. First he easily immobilizes them and matches the dragons in mind-fighting. Then for his entertainment he makes Murtagh and Eragon fight without magic. A fight which Eragon wins. Then Murtagh breaks his bond with Galbatorix and attacks him, however Galbatorix recovers. Then he attacks Eragon to make him swear an oath of allegiance to himself. Eragon manages to take the help of the dragons and casts a spell through his mind beyond himself and without plan. He makes Galbatorix feel the suffering the he made the others endure. Ggalbatorix weakens. Thorn and Saphira attack Shruikan. Arya takes the Dauthdaert and kills Shruikan. Galbatorix unable to bear the pain kills himself in an explosion that nearly destroys everyone, when Eragon gathers everyone and utters a shielding spell. So the Varden wins. Nasauda becomes the successor to Galbatorix. Eragon decides that he needs to leave Alagaesia and find a place to train the new dragons and dragon riders. Arya takes with her a dragon egg they find in Uru'baen which hatches for her. Arya also becomes the new elf-queen. There obviously is the chance that Paolini might do a Tolkien and make this world he has created richer. I am certainly looking forward to that.